Haryana is the place where the epic battle of Mahabharata was fought and it is also the place where the holiest book of Hindus, Bhagavad Gita, was introduced. So, when Haryana is such an ancient place, which has been in existence since the Vedic Period, it is certainly expected from it to host some of the oldest sites and religious spots. Pehowa is one amongst the many places in Haryana which are somehow and somewhere related to the epic Mahabharata and hence, these places are of religious and historical significance. Do you always get fascinated by the interesting legends from the past? If yes, then Pehowa is certainly a destination for you this season. Ranging from the stories of Lord Krishna to the legends of Mahabharata, you can learn a lot within its boundaries. So, how about a trip to Pehowa in Haryana? Located in the Kurukshetra district, Pehowa experiences hot summers and hence, for common tourists, it is never a preferable choice. However, for Hindu devotees and offbeat travellers, who love exploring the beauty of ancient places, Pehowa is a year-round destination. The best time to visit Pehowa, considering its climatic conditions, is from September until the end of March. Located in the Kurukshetra district of Haryana on the banks of Sarasvati river, Pehowa is a sacred town, which is believed to have been founded before the Mahabharata period. Hence, each and every corner of the town is somewhere related to the epic. It is famous amongst tourists for its temples and other religious sites and hence, it has become a pilgrimage destination over a period of time. As per records of ancient texts, Pehowa is the place where Lord Krishna came with the Pandavas to take the blessings of Goddess Saraswati before the war. However, as per historical records, it is also said to have been ruled by the kings of Tomara dynasty during the 9th century. Today, Pehowa is considered one of the most visited pilgrimage destinations in Haryana where tourists and Hindu devotees come in millions every year. Being a town from the era of Mahabharata, Pehowa is called by many the site of salvation. It is famous amongst tourists for Prithudak Teerth and Saraswati Temple, which are categorised under the holiest places on earth amongst Hindus. Taking a dip in the pristine waters of Saraswati Temple is said to wash away all the sins of an individual. 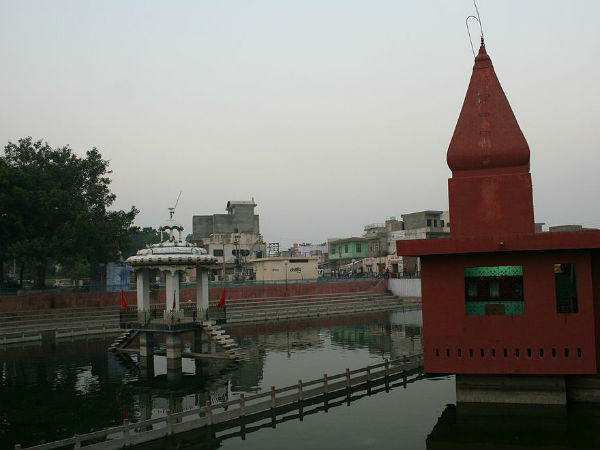 The complex of Prithudak Teerth and Saraswati Temple is a part of 48 kos parikrama of Kurukshetra, the region of pilgrimage sites in Kurukshetra. The town of Pehowa is so religious that the slaughtering of animals and the sale and consumption of non-vegetarian food is banned within its boundaries. Wouldn't you love to be at such an amazing place filled with devotion, composure and spirituality? Several other temples in the town include Kartikeya Temple, Prachi Tirtha and Pashupatinath Mahadev Temple. Apart from visiting the religious sites of Pehowa and feeling the essence of equanimity and devotion, you can also explore beyond its boundaries and visit several other places of interest in Kurukshetra which include Brahma Sarovar, Bhadrakali Temple, Jyotisar, Tomb of Sheikh Chehli, Bhishma Kund, Dharohar Museum and Lakshmi Narayan Temple. Isn't it a place worth exploring? From learning about the ancient culture of the town to witnessing the quintessential places to gain peace, you have a lot of opportunities here. So, how about a visit to Pehowa now? By Air: The nearest airport from Pehowa is located in Chandigarh at a distance of about 110 km. Once you are at the airport, you can either hire a cab or take bus to Pehowa. It will take you an approximate time of 2 h to reach your destination from Chandigarh. By Rail: Located in the Kurukshetra district, Pehowa can be reached easily by catching a train to Kurukshetra Junction and then from there, a bus or cab to Pehowa. Kurukshetra Junction is located at a distance of about 30 km from Pehowa. By Road: The best and most convenient way to reach Pehowa is to take a road journey. Pehowa is easily accessible by road.